Introduction to the book “Radical Forgiveness” by Colin Tipping, and the five stages of Radical Forgiveness. 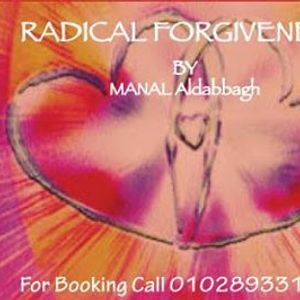 The tools of Radical Forgiveness—a series of quick, effective, and easy-to-use techniques and processes including “Fake It ‘Til You Make It,” “Collapsing the Story,” “Satori Breathwork,” and more. I’m a daughter, a sister, a friend, a wife, and a mother of two boys with personalities as different as day and night who are also two of my greatest teachers. I grew up in Jeddah, the western region of Saudi Arabia, moved to Dhahran, the eastern part in 2002, lived in Houston, TX and Seoul, South Korea, to come back in 2013 to live in Dhahran again. I have experienced and learned from the east and west…literally! My learning journey has taken me, so far, into Biochemistry, non-profit, stress management, and Nia to name a few. Each field has given me a different outlook and experiences that I have yet to discover how it will all link up and help me in achieving my life’s purpose. I strongly believe that every degree, certification, belt I earned, books I’ve read, and teachers I’ve been honored to learn from, have been there for a reason and helped me in becoming the person I am today. I am currently a certified Nia1st Degree Black belt teacher, certified Health Coach, Radical Living Coach, and Ageless Grace Educator. My mission is to guide and help others take control of their life by taking small steps that will lead them to the best life they aspire for themselves. Understanding that everyone is unique and need different strategies and needs is at the core of my approach. A specific mission for me is to encourage people to reconnect with their bodies through movement and dance. I look forward to the day when I fulfill my dream of becoming a dance/movement therapist. Coffee and books! Can spend endless hours with those two ? Getting to know people and having meaningful conversations. Discovering, listening, and dancing to music. Organic, fair trade, and natural products. Organic farming and sustainable living. Social Responsibility and benefit cooperations. Become a B Corp consultant. Create a community of women supporting each other. Visit all my Nia friends around the world. *Booking is required before the 20th of March.